Getting started on Etsy is scary, I get that. But today I was in a group that I love and a gal there was talking about how she wanted to get started on Etsy but she didn’t know what to do. She already had people who wanted to buy her items locally, but she didn’t know how to sell them or price them or make them or ship them…ack! So today I want to talk to YOU, someone who is considering selling on Etsy but who has some fears about whether or not to do it! please note :: I often recommend resources, some I receive an affiliate commission for at no additional cost to you, these all help to keep this site free for you! Let’s get started right at the lizard brain level. Unless you are a sociopath, everyone experiences some level of fear or trepidation when starting something new. It can seem overwhelming and scary to figure out all the parts of anything new. So let’s get all those fears right out there in the open! I could go on and on with questions that might be running through your head right now. But please, just stop. I am hoping seeing them all together like this will shock you out of your obsessive worrying! That is it. Yes, at this point you can take a few minutes and search on Etsy for other people selling what you are selling and jot down a couple of notes about what you might use as a pricing structure. I find it amazing that someone who has never listed one item is worrying about Etsy SEO or shipping overseas. Put up one item, shipped only to your own country and get started. I here to break some bad news to you… you can’t do anything perfectly. Think about your first kiss, there was probably a lot of nose bumping and fumbling around. 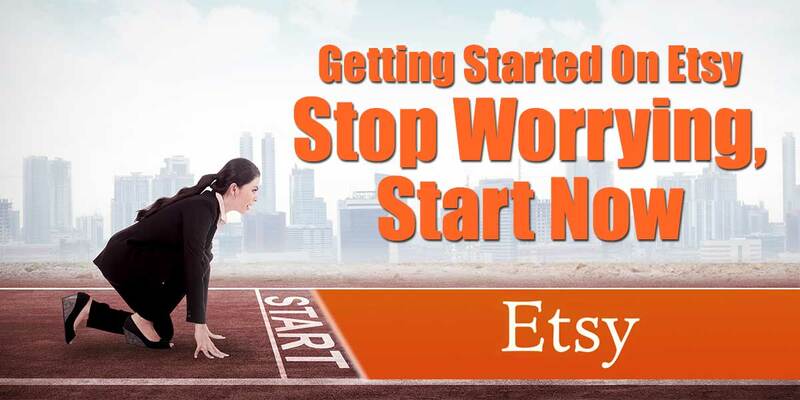 Now think about how you are trying to set up the “Perfect Etsy Store”. That is not a thing. No one has ever done anything perfectly from the start. In fact your first few items SHOULD embarrass you later. You should think, what the hell was I thinking with those pictures or description or title. That means that you were brave enough to try before you knew all the answers. One phrase (start with the end in mind) has killed more entrepreneurs than any other. Yes, you should have goals and dreams and plans for your Etsy store, BUT you cannot know anything about an Etsy business until you have an Etsy business. Even if you hire someone to walk you through setting up you store, organizing your shipping station or branding your business, there will a million other questions that you will have along the way because every business really is different. Some take off like a rocket ship, selling hundreds of items a day and some start slower and build up as they go. Some items are heavy and bulky to ship and some are light and easy. Some mail carriers love their customers and will gladly come to your door and some are hateful and mean, stomping on your packages before throwing them into the back of the truck like Michael Jordon shooting a free throw. There are too many variable to each business to count and becoming paralyzed by all the options is not how you are going to act anymore, right? You ARE going to list your first item today! Oh the crying, wailing and teeth gnashing I see on the Etsy boards and in the Etsy groups. If you are spending time there getting ready to sell, you might think that having an Etsy shop is the worst thing that can happen to a person! But those are highly concentrated exceptions to the rule by people who are just looking for validation that they are doing okay. I am SURE that don’t mean to be negative and scared and defensive, but seeing them all in one place like that could scare anyone away. Something WILL go wrong. Whew, now you know and move on with listing your first item! Someone will put a wrong mailing address or not be able to download your file or give you a bad review. You will make a mistake on shipping and have to eat the cost. You will be a bad packer and something will break in the mail. Don’t worry about what COULD go wrong, just know that something WILL go wrong and you will learn from it!!! So now that you are properly ready to fail a couple of times I want to talk about succeeding and celebrating those wins! The first view – You can’t sell anything if someone doesn’t see it so getting that first view is super cool! The first favorite – Oh my gosh, someone likes your stuff enough to save it for later! The first sale – Probably your mom or besty, but your brain doesn’t know any different…celebrate it! Your first sale from a stranger – Whoo whoo… that feeling! Your first 5 star review – Not only did they buy it, but they liked it! Once you have had those experiences, now you can take the next step and learn something new. No, not everything else but one more thing to get good at! 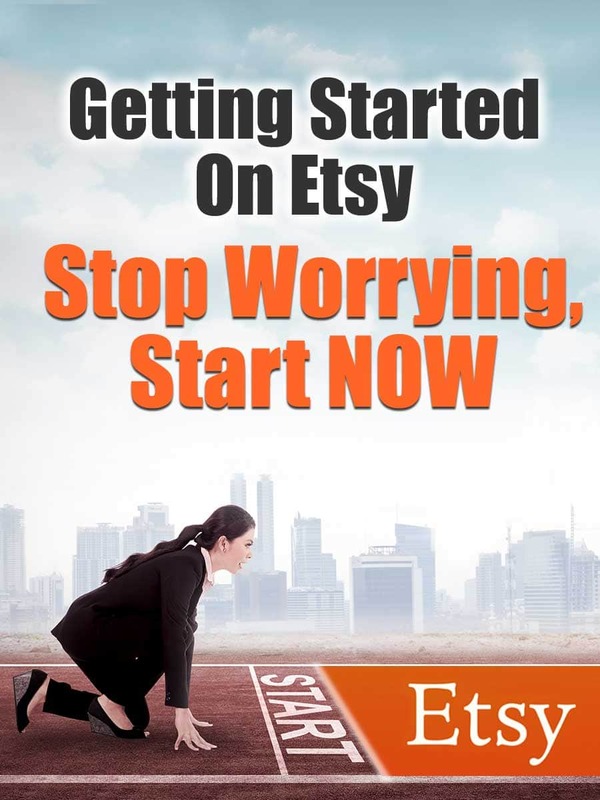 Etsy SEO – Because you are new, the easiest way to get more views (and hence more sales) is to get more views on Etsy. It is a good idea to learn a bit more about how to craft your titles, tags and materials. Descriptions – I am breaking this one out because it doesn’t effect Etsy SEO but it does make humans more or less likely to buy from you. Do a search on YouTube about copywriting and get a little more creative in your descriptions. Sourcing – If you are selling more than a few items, there is a good chance that you will want to take a look at your cost of goods and see if you can source them more cheaply or from a better supplier. Now that you know your sales volume, you can make better decisions about how much material to have on hand. Product Photography – Once you have the technical aspects of doing your listing done, then you need to look at getting better at photography. Because people can’t see or touch your items, you need to make sure that your pictures tell a story of how they will use your products. Etsy Marketing – Considering this is a marketing blog, you may be surprised that marketing is so far down the line. Spending time “building up your Facebook page” or growing your Instagram followers is not productive unless you have great products and photography to sell them with. Yes, marketing is important but it is way down the line when you are starting. It is not that long ago that I was getting started on Etsy and there have been some great resources that helped me SO much. Here are a few that you should check out! Etsy Conversations Podcast – Oh my gosh, if you don’t know about this one, make sure you sign up today! Ijeoma, the host, interviews successful Etsy sellers weekly about what is going well with their sales. Handmadeology – I found that much of the information I was finding on Etsy Marketing was out of date but Tim’s site current and has great info. Free Handmade Training – Renae Christine was super valuable to me when I was getting started. While I don’t use ALL of her practices, her down to earth (and funny) way of presenting was stupendous for making everything seem doable!